Hackathon participation is jeopardized by a scheduling conflict. Latina sixth-grader Sophia Torres is excited about her first hackathon: an all-day coding event with prizes. Each team receives components and modules to build a robot to attempt a maze, so the girls from The Friendship Code (2017) talk algorithms and pseudocode to plan out how they’ll make their Rockin’ Robots entry stand out. Sophia hopes her busy mother will be able to come support her, but instead her parents drop a bombshell: the night before the hackathon registration deadline, they tell her that she must miss it to babysit her sisters (an 8-year-old on the autism spectrum, a 5-year-old, and a 2-year-old). The hackathon has a strict, plot-determined rule: if any registered participant can’t attend, the whole team must withdraw. Sophia gambles her team’s eligibility on her ability to convince her babysitter-averse parents to compromise. After blaming Sophia (saying she should have told the team sooner), they tease her with the possibility of a babysitter: her father gives her an extensive list of chores she must complete for him to “consider” letting her go. Once the team learns, they surprise Sophia by helping her complete her domestic duties and arranging for the babysitter so she can participate. Evidently the moral’s about asking for help; regressive ideas and plot-driven, questionable parenting are never addressed. 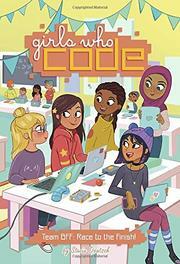 The diverse cast also includes white, black, and Asian teammates as well as a new-to-the-team girl from Pakistan (who, curiously, gives their robot an Arabic name rather than, say, an Urdu one) and a dark-skinned boy Sophia has an age-appropriate crush on.